An NBA guard can completely dictate a fantasy basketball game and be the difference between you cashing in at FanDuel, or losing even a FREE fantasy contest at DraftKings. The guard position is made up of both Point Guards and Shooting Guards and for the most part, our list of Top 10 NBA Guards for FanDuel and DraftKings lineups are made up of point guards since they are who the offense runs through. If you are going to pay up for a DFS player, you want at least one top guard as a pick as well as a top forward. Get a FREE Contest Ticket when you join and deposit to DraftKings and 5 free contest entries when you join and deposit to FanDuel! With the loss of Kevin Durant, Westbrook IS the Thunder. He has shown in the past that he can run the offense singlehandedly and he will do just that in 2016 and 2017. His usage rate last year without Durant was 39%...expect that to go up! You can almost expect triple-doubles almost any game he plays this year. A very close #2, Harden can do everything for your fantasy team. 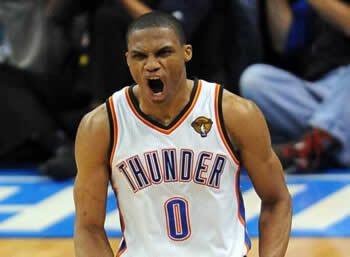 He is switching to the point guard position this season which makes him also a triple-double threat each night he plays. Curry can do it all but the Warriors have a new player in Durant and still have Green and Thompson…they can’t all score at the same time! Curry had a historic fantasy basketball season last year but he will have his numbers drop a bit as they share the touches in Golden State. Not a lot of talent in Portland so Lillard is usually the one carrying the heavy load. Had a great year averaging 25 points a game with 6.8 assists and 3-threes per game. One of my favorite DraftKings Fantasy Basketball picks every night he plays. Lowry is playing for a new contract and he just saw his buddy DeMar Derozen get paid…Lowry looking to get paid too! Lowry can take over a game but is prone to bad shooting nights that create ugly lines. Playing against bad defenses, stacking Lowry and Derozen usually pays off at FanDuel. Many lists have Paul ranked higher but although he produces good numbers every night he plays, he rarely takes on a game and sets the world on fire like others ahead of him. You will get fantasy points with Paul but look for him when he is lower priced compared to others on the list. Has averaged more than 10 assists/night each of the last 2 NBA seasons and last year averaged 19 points/night. He is coming off surgeries to both knees so you may want to wait a few weeks to make sure he is up to speed but he is worth the pick for the double-double every night potentially. Butler is a guard but will play all over this year with new additions Rondo and D-Wade. Butler is the Bulls franchise but his usage numbers will decline with new players looking for the ball in Chicago. Thomas had a great year last year and puts up all the typical guard numbers for fantasy lineups. He can light it up on given nights so look to use him when he is playing another fast tempo team to maximize his scoring chances. Broke out last year with an improvement in his scoring numbers but he has always been good for assists and steals along with dropping a 3. Is usually a lower cost play at DraftKings so scout for the right matchups and pick him when the value is there.